FILE - A Catalonia independence flag waves on a mast of a boat at the port of Vilanova i La Geltru, Spain, Oct. 31, 2017. Covert attempts by Russia to support Catalonia's independence bid using disinformation and cyberattacks to support separatists may be part of a long-term strategy to penetrate and gain control not only of Spain's wealthy northeastern region but also other parts of Europe, Spanish officials tell VOA. Spain and NATO are investigating allegations that thousands of social media trolls or robot accounts were set up in Russia to amplify distorted or "fake news" items aimed at influencing a referendum for independence held October 1 in Catalonia. No direct link has yet been established between the Russian government and the cyberattack, but much of the activity has been traced to a property near the city of St. Petersburg that is owned by a close business partner of Russian President Vladimir Putin, according to testimony presented at a Spanish congressional hearing Thursday. The cyberattack also has involved attempts to hack email accounts of opponents of the independence movement, according to the victim of such an attempt, Erik Encinas, who told VOA that Google traced an attempt to intercept his emails to a Russian source. Russian crime organizations have been trying to gain leverage in the region for years and recently came close to taking control of the Catalan security ministry, a high-level intelligence officer operating in Catalonia who requested anonymity told VOA. The intelligence officer, working for one of Spain's main security services, participated in an investigation known as Operation Clotilde, in coordination with the U.S. Treasury Department. The investigation targeted money laundering by Russian crime syndicates through Catalonian banks, shell companies and real estate investments. The intelligence officer told VOA some of the Russian money went to the Catalan nationalist Convergence and Union (CiU) party. The Catalan European Democratic Party (PDeCAT), a radical CiU faction, joined the leftist ERC and CUP parties to form a regional governing coalition that held the October referendum for independence, which was ratified by Catalonia's parliament. Money laundering investigations were centered in the Catalan seaside resort of Lloret de Mar, whose former CiU mayor, Xavier Crespo, was indicted in 2014 for taking bribes from alleged Russian crime boss Andrei Petrov. In 2013, Catalonia's regional government appointed Crespo to the key post of security secretary, equivalent to a ministerial position, and one in which he would have controlled the Catalan police. "His appointment was overturned when we reported our investigation to the regional government," the intelligence officer told VOA. The officer pointed out, however, that Crespo's association with Russian crime figures was well-known: In 2008, Crespo had made a much-publicized trip to Moscow and was hosted by Petrov, who took him on a helicopter ride. Crespo was celebrating his security appointment in Lloret de Mar's city hall when a unit of Spain's Civil Guard gendarmerie "met with the Catalan regional government to inform them of our findings," the Spanish intelligence officer said. FILE - Ousted Catalan leader Carles Puigdemont addresses Catalan mayors who traveled to Brussels in support of the ousted Catalan government in Brussels, Belgium, Nov. 7, 2017. Spain, which imposed direct rule in the region after last month's independence vote, now faces the delicate task of taking control of Catalonia's police force. Most members of the regional government have been arrested, including security chief Joaquim Fom, who has been accused of supporting the independence bid. 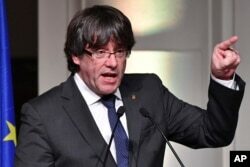 Catalan police also failed to prevent the escape of regional President Carles Puigdemont to Belgium, where he is trying to establish a government in exile. "The Russians would be looking to fill the void left by Catalan and Spanish companies that are leaving due to the instability," the Spanish intelligence source said. More than 2,000 companies have transferred their headquarters out of Catalonia since October, including major multinational firms. Spanish Intelligence analysts say that Russians see an independent Catalonia as a possible base from which to penetrate other parts of Europe, where their business activities are restricted by sanctions enforced by the United States and the European Union. Russian officials have denied Spanish and NATO accusations. But Putin has made no secret of his desire for revenge against the West for recognizing the 2008 unilateral independence of Kosovo, which caused the dismemberment of Serbia, a close Russia ally. A Kremlin operative who acts as the virtual foreign minister of South Ossetia, which separated from the former Soviet republic of Georgia and came under Russian military protection in 2008, visited Barcelona last month to establish an "interests office" and meet with local businessmen, according to Spanish press reports. The Kremlin operative also traveled to the Italian region of Lombardy, which is holding a referendum for greater autonomy from Rome.